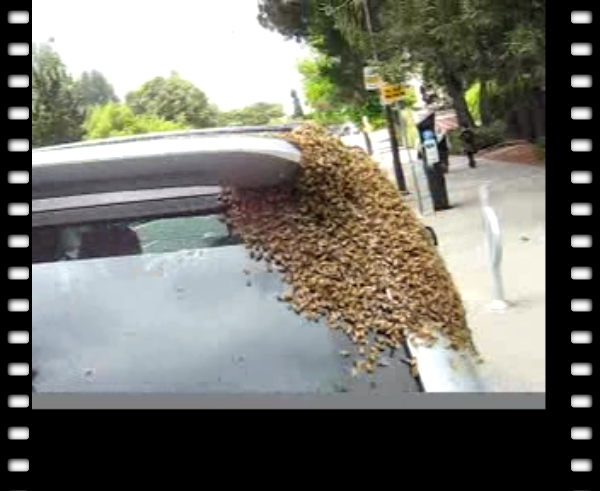 (Berkeley, CA) Calling for an end to "mean ag" and car culture, and seeking that the human species join a growing planetary alliance for the protection of mother earth, bees swarmed an SUV parked in front of Boalt Hall in hopes of securing legal and policy help for their cause. The bees, singing love songs for planetary harmony, announced a new era: "No More Mrs. Nice Bee." Bees are refusing to pollinate crops until their demands are met. The recent disappearance of bees, they sang, is in protest of increasingly harsh conditions imposed upon them by corporate agriculture, and a growing concern that a wave of mass extinction will only accelerate in the near future without an immediate and drastic change in course. The bees put the blame squarely on the heads of humans, who they say have exhibited astoundingly poor planetary citizenship for over 2,000 years. "We got the idea from the Rand corporation report on swarming, which focused on Critical Mass bicycle rides as a military tactic," said a cluster of buzzybooz. "We felt that if bicyclists are willing to brave offering an alternative in the face of, that we certainly can." The bee troop noted that groups of bicyclists are gathering to protest in opposition to the G8 this coming Friday in towns around the world. "Immobilizing this SUV may seem insignificant," they admitted, "but it is a small taste of what is to come," referring to the overall bee strategy for compliance from Homo sapiens. "Next we will target gas station pumps and even refineries and oil tankers," stated a spokesbee. The bees hope to leverage their potential impact by targeting particularly sensitive weak links in the petroleum-dependent "System of Destruction." North American bee colonies have converged for the first annual "Sting the System Honeyfest" Apiary Action Camp, which kicked off with a tribute to Tom Robbins' Jitterbug Perfume, a novel in which bees hold the City of New Orleans captive in an allegorically similar, timeless drama of survival. "That guy understands us," said the Queen Bee, who hopes that more humans will obtain consciousness. "Well, that'll keep me away from a car," admitted one passing American consumer. "Good plan," said another passerby. The Bush administration is expected to respond by issuing a code red terrorist alert, with the president vowing to see through new tax cuts for pesticides, sting-proof suits, and total eradication of the entire superfamily, Apoidea. "I din' like bugs to begin with," he said. Local sustainability advocates decried the Federal approach, saying it would lead to endless famine and suffering. "Like Einstein said: Without bees, we are lost. It's time to face the music and own up to our responsibility to earth," said Professor Buzz. "They really are sweethearts. Just be nice to them. Seems like a reasonable request. Creatures treat you as you treat them," said Dotty Tomorrow, 6, of Berkeley, who hopes to be able to live on planet earth in the future. For more information about modern carfree cities, visit http://www.worldcarfree.net/ and http://www.carfree.com/. For more information about bees, take a moment to appreciate flowers and the foods which fruit of them. Caution: this story contains satire and artistic license. The video has been edited. The bees really are pissed, though. Thanks for making video on demand available at Indybay!